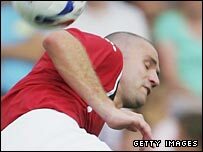 Falkirk have signed Michael Higdon after the striker decided to end 10 years with Crewe Alexandra. The 23-year-old had rejected a new contract after scoring three goals in 28 appearances for the English League One outfit last season. Bairns head coach John Hughes told his club website: "We've tracked his progress over the last year. "Falkirk have been missing a strong presence up front and Michael will give us that option now." But Hughes insisted that it would not see an end to the Bairns' passing style. "Dario Gradi has been his mentor and Michael will have learned a lot as the Crewe boss likes to play the same style of football as we do at Falkirk," he said. The Bairns say there were a number of clubs chasing the signature of Liverpool-born Higdon. But he said he was "thrilled" to have the chance to play in the Scottish Premier League. "Falkirk were one of many options I had, but I was overwhelmed by the ambition shown by the people there and that convinced me it was the right place to go," said the striker.